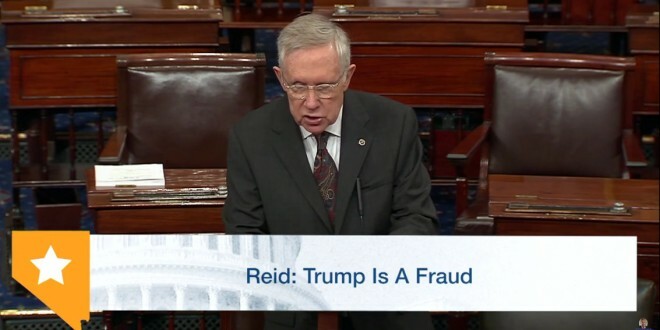 Sen. Harry Reid Goes Ballistic: Donald Trump Is A Sexual Predator Who Has Unleashed A Tide Of Hatred - Joe.My.God. President Barack Obama, Hillary Clinton, Chuck Schumer and Nancy Pelosi — all of them offered conciliatory statements about Donald Trump’s election victory. Then there was Harry Reid. In a blistering statement Friday, the retiring Senate minority leader attacked the president-elect as a “sexual predator who lost the popular vote and fueled his campaign with bigotry and hate” and said that he fears for the treatment of Latinos, African Americans, gay people, Muslims and young girls under a President Trump. He also criticized the media for covering the transition to Trump as normal, even as Obama and Trump had a civil meeting on Thursday and Schumer, the incoming Democratic leader, spoke with Trump on Wednesday.